Andy Murray, hailing from the small town of Dunblane in Scotland, was the first British male in 77 years to win Wimbledon in 2013! Having already won his first match of the 2016 championships, Wimbledon fever has hit the Foundation this week, with frantic googling of tennis terminology during live commentaries (ace is not just a synonym for super) and sudden cravings for strawberries and cream! The hype around Wimbledon grows every year and encourages many spectators both at Wimbledon and at home to pick up a tennis racket and get involved. People of all ages and occupations enjoy tennis but, you may be surprised to hear that Mary Queen of Scots used to enjoy a game or two – in breeches no less! She played at Falkland Palace, a NTS property only 40 miles away from Andy Murray’s home town (there must be something in the waters of the Firth of Forth). The grounds of the palace are home to the oldest Real (or Royal) tennis court in Britain, built for King James V, which was where Mary Queen of Scots would play on her visits to the Palace. 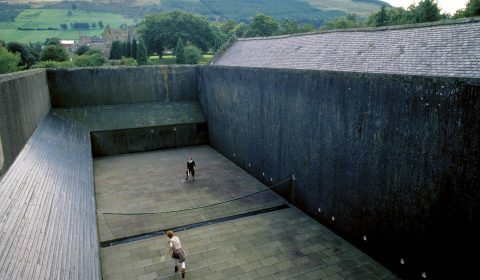 It is the only ‘roofless’ real tennis court in active use in Britain and the only surviving example of the earlier jeu quarré court design (with 2 rather than 3 sloping penthouse galleries). Not quite big enough to host the 15,000 spectators at Wimbledon! 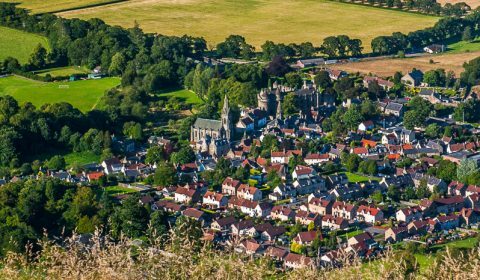 Falkland Palace is set in the picturesque village of Falkland surrounded by extensive gardens. In the 12th century, the palace started as a hunting lodge, where the Stewart kings would hunt in the great forest of Falkland. It then became a MacDuff family castle and was acquired by The Scottish Crown in the 14th century. Between 1501 and 1541 James IV and James V transformed the castle into the Renaissance palace visitors see today. 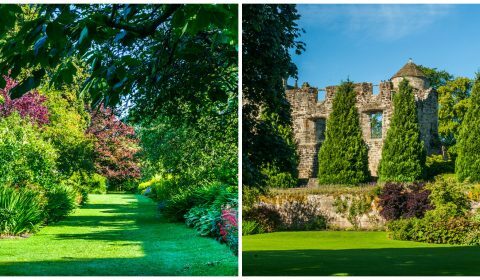 James V died at Falkland in December 1542 after hearing that his wife had given birth to a daughter—Mary, Queen of Scots, who later would become very fond of the palace and its gardens. 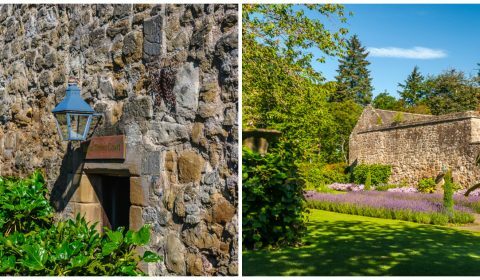 The physician’s gardens are a testimony of her time there, which can still be seen today in the grounds at Falkland. They continue to grow medicinal herbs that many years ago would have been used by the Royal Physician to cure his patients’ ailments, as well as for creating perfumes and seasoning foods. In 1603 James VI stated his preference for London over Edinburgh, and Falkland lost its appeal. This was shortly followed by the detrimental visit from Cromwell’s troops who stayed there before they headed for Perth during his conquest of Scotland. They set fire to the palace and evidence of this can still be seen today in the east range. It wasn’t until 1887 that work on the restoration of the palace began by John Crichton-Stuart, 3rd Marquess of Bute. Falkland Palace has been in the possession of the Crichton-Stuart family since then and in 1952 the National Trust for Scotland was appointed the custodian of the Palace. Although the east range is still in ruins the original and reconstructed rooms are packed with 17th-century Flemish tapestries, elaborately painted ceilings, and antique furnishings. The Real Tennis court still sees competitive action as the locals in the village are known to organize tournaments – original Real Tennis rules and equipment only, of course! The tennis court is just one of the impressive feature on the grounds of Falkland Palace. In 1947 Percy Cane, a celebrated artist, horticultural writer, and garden designer was invited to reinterpret the formal garden surrounding the palace, following its use for growing potatoes during the Second World War. Cane created a twentieth-century design for the garden that is widely acknowledged as outstanding for both its historic value and as a work of art. Falkland Garden is the most complete example of Cane’s work in Scotland. Sadly, the gardens deteriorated over the years and no longer represent Cane’s famous design work. Plant species selected by Cane have disappeared from the original flowerbeds and many have overgrown with the lawns falling victim to weeds and diseases. The Foundation’s annual appeal last year was to restore Percy Cane’s masterful design to its original glory. The redesign will increase visitor enjoyment of Falkland and offer horticulture students and community members the opportunity to gain hands-on experience in the garden. We were thrilled to meet the anonymous challenge to support the restoration of the historic Percy Cane-designed garden at Falkland Palace. The challenge matched every gift restricted to the garden’s restoration through the end of 2015, up to a total of $25,000. The $50,000 grant will allow the Trust to begin restoring Cane’s original planting design. Helen Sayles, chairman of the board of The National Trust for Scotland Foundation USA, commented on the successful fundraising effort and the Foundation’s commitment to conserving Scotland’s designed and natural landscapes for future generations. After the success of the Percy Cane Garden, the Trust sought to add a contemporary touch to the visitor experience at Falkland by offering a winter light show with the assistance of students from the nearby University of St. Andrews. A vibrant light display will highlight and reflect the ancient building, gardens, and trees, imaginatively enhancing them and creating an atmospheric wonderland. A test event last year sold out far in advance and proved extremely popular; this year’s presentation will be a key event for Scotland’s designated Year of Innovation, Architecture, and Design and was made possible in part with funding from a generous American donor.